We help organisations build sustainable capability in Project Management, Technology and Team Effectiveness. As part of the Underscore Group, we can help you achieve sustainable results through our unique experience. Working with your organisation, teams and individual employees we can help you build the sustainable capability needed to survive in today’s fast moving, rapidly evolving, competitive market. We have a range of pre-designed programmes, ideal for the quick and on demand learning needs of your employees, as well as the ability to create a tailor made learning package for your team focusing exclusively on their development needs. Visit our customer stories page to hear what some of our customers have to say about our programes. Underscore Training is delighted to announce an official partnership with Deltek, the leading global provider of software and solutions for project-based businesses. We specialise in all aspects of Project Management training with a team of varying backgrounds and areas of expertise. We provide training on accredited techniques such as PRINCE2, MSP and PPC, as well as tools and vendor neutral programmes. Click to learn more. Our range of programmes cover everything from implementing a new IT system to helping to improve productivity via office applications. We offer training in key software such as Excel, PowerPoint, Visio and VBA, as well as bespoke systems. Click to learn more. So often behavioural training is forgotten while people focus on the technical skills to do the job. Our team development programmes support you in nurturing high performing teams and developing your talent into the leaders of tomorrow. All of our pre-designed courses can be delivered in-house for your team, but if you have specific training needs we can also design a unique programme just for your employees. Please get in touch to learn more about our bespoke training and to discuss your needs. Underscore Training is pleased to announce the launch of its new London venue for training. We are based at the iconic Holborn Bars building near Chancery Lane tube. 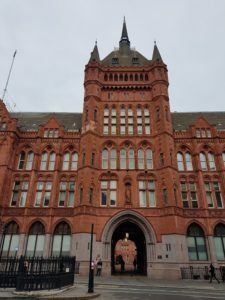 This beautiful Victorian building was built by Alfred Waterhouse the architect of the Natural History Museum famous for his use of terracotta. It has now been transformed into a luxury venue, with much original decoration. We will be running a small public programme out of our London venue and it is also available for you to book group courses as well.